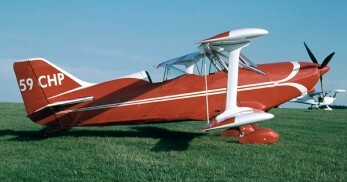 Peter Funk started in 1994 with the development of an Ultralight biplane, which went in production at the end of 1997 as the FK-12 Comet. The FK12 Comet is an ultra-light two-seat aerobatic biplane design using modern materials. It has good flight performance with optimised laminar flow wings with 4 full length ailerons (flaperons) making it highly agile with good visability. The wings fold down in a few minutes giving it a width of only 2.42m for storage.